GTBets is an online sportsbook and racebook that offers wagers in all major sports markets. The company is very client-focused, offering live chat and a wide selection of promotions that new and established members alike can use to stretch their bankrolls further. GTBets offers one of the best new customer bonus packages available to U.S. visitors. While most sports welcome packages offer a 50% deposit bonus, GTBets offers a 100% deposit bonus for up to a $500 bonus. And the bonus is CASHABLE once the wagering/rollover requirements are met! Register your new account with GTBets promo code MAXBONUS to qualify. Click here to visit GTBets. GTBets offers the kind of welcome bonus we normally associate with online casinos. There’s no free bets here or losing bet propositions. 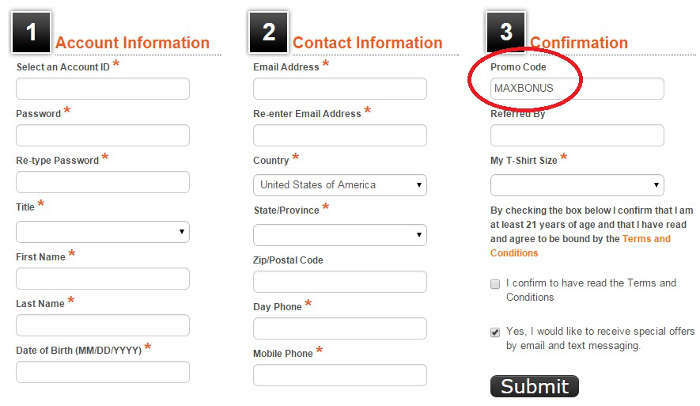 Simply use the promo code MAXBONUS when registering your account, and then make a deposit of at least $35. With the GTBets bonus code MAXBONUS, you will receive a match bonus on your first deposit of 100% up to $500. And then make a second deposit and receive another bonus of 50% up to $500! 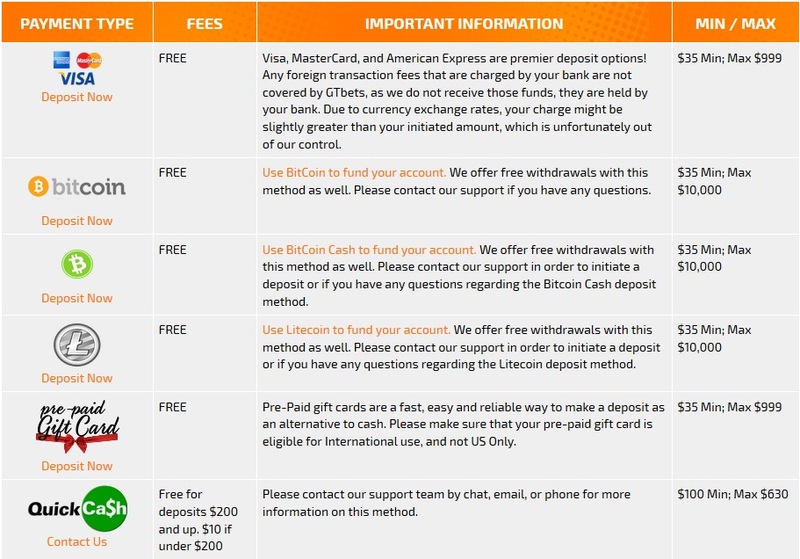 GTBets offers many deposit methods with no transaction fees, including Visa, Mastercard, Amex, and Bitcoin. Getting your money in is pretty easy, but there are way less options for cashing out. That’s why we recommend depositing and withdrawing with Bitcoin. There are basically only 2 methods for cashing out – and that’s via Bank Wire or Bitcoin… and the Bank Wire option will cost you $60 each time, while Bitcoin is free. After you make your first deposit, now it’s time to earn your welcome bonus. 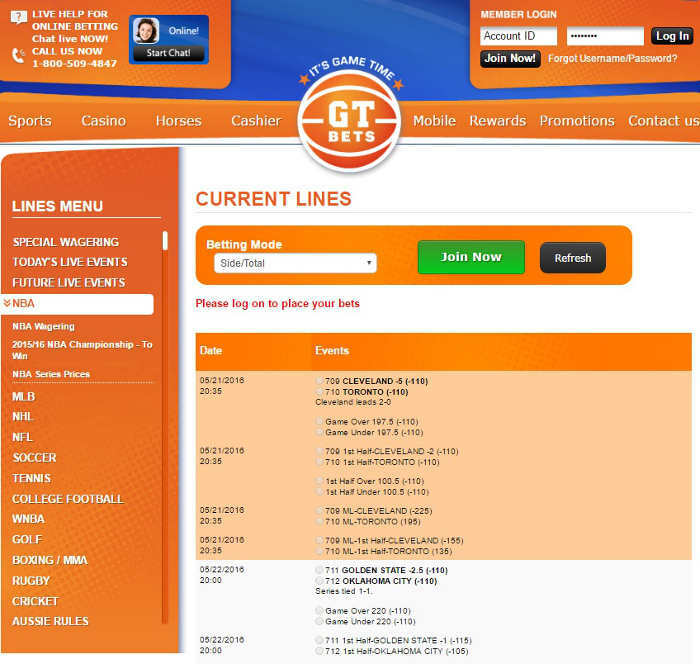 GTbets uses a Rollover Points system. For this offer, you need to earn rollover points equal to ten times (10x) the bonus amount if you bet on sports. If you deposited the minimum $35 and earned a $35 bonus, you’d have to earn 350 RPs. In order to earn points, you must place bets that have odds greater than 1.33 or -300 and will earn five points for each $10 wagered. Withdrawals aren’t allowed until you’ve met the requirement, but once you have, all bonus money is fully cashable! One of the unique aspects of the GTBets bonus is that not only can it be earned betting on sports, but the bonus can also be earned by betting on horses and playing in the casino. You can actually earn the bonus easier by betting on horses, as there is only a 6.7x rollover requirement on the bonus amount. Consult the chart below for details on earning Rollover Points. GTbets also offers reload bonuses, and what’s neat is that this offer is good on all deposits and applied automatically. You can opt out, however, if you so choose. In order to be eligible, your current account balance must be equal to or greater than 25 percent of your last deposit amount. If your last transaction was a withdrawal, you’re not eligible for the automated reload bonus. Reload bonuses can match the deposit as high as 50 percent and have a rollover point requirement similar to the welcome offer. One of our favorite promotions at GTbets, and something we wish all online books would do, is the concept of a favorite team. A lot of sports gamblers put a few dollars on their teams each week regardless of the odds. What GTbets lets you do is a pick a favorite team for the season, and they’ll automatically give you bonus odds on each wager placed on that team. It’s worth mentioning that you can also use this opportunity to get better odds on a team you expect to be particularly dominant in a given season. Another great concept that GTbets has come up with is the progressive parlay. This is a progressive jackpot that you have a shot on each time you place a 15-team parlay bet. The jackpot is seeded at $50K and grows each day there’s not a winner. At the time of this writing, it was over $65K. Eligible bets have to involve at least 15 teams and have a $5 stake. Anyone who wins his or her bet gets the standard winnings for the bet as well as the jackpot. Currently this promotion is limited to the NFL, NCAA football, NBA and NCAA basketball. Each month, you’re entitled to a 15-percent on your net losses from all racebook bets. If you have no net losses in a given month, there’s no cash back. If you do, then the bonus is automatically deposited into your account on the first day of the new month. If you received any bonuses that month, those will be deducted from the rebate. However, the rebate is not itself a bonus. There are no wagering requirements, and you can withdraw that money immediately. Finally, GTbets has special sportsbook and racebook promotions each month that are only available through the GTbets newsletter. Subscription to the email newsletter is not automatic with registration, so be sure to opt in via your account settings on the GTbets website. GTbets offers both standard and in-play betting. You’ll find all markets listed in the left-hand menu. At the top of that list is Special Wagering, which includes parlays, teasers and 60-minute wagering, and Today’s Live Events, which has all events that support live betting. Even e-sports and politics are listed, and bets on those markets count as sports bets. At the top of a particular market is a Betting Mode dropdown, which you can use to select bet options like parlay, if-bets, side-total and so forth. Clicking Betting Stats at the bottom of the page will give you access to a substantial amount of stats concerning leagues, matchups and individual teams. 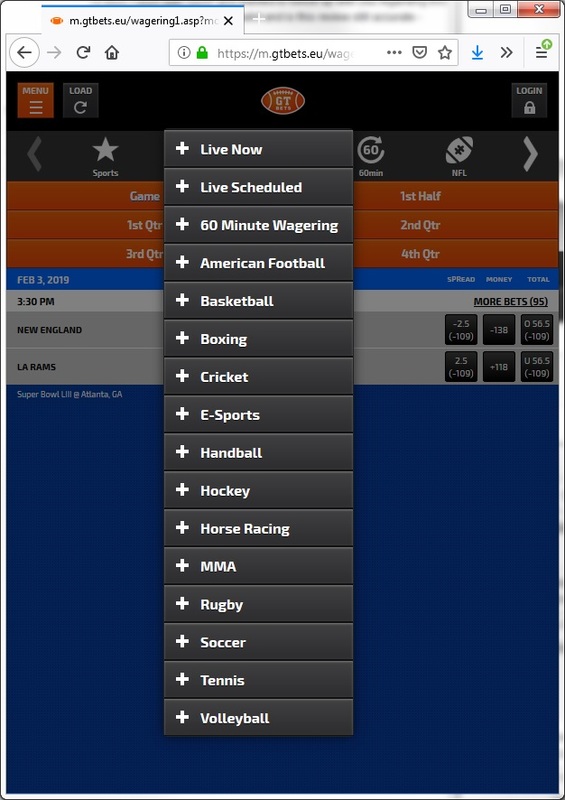 GTbets doesn’t used a dedicated mobile app. Instead, when you access the website, it’ll automatically detect you’re on a mobile device and feed you the appropriate version of the site accordingly. What this means is that the experience is mostly the same across all devices. You even have access to the entire stats library. A nice feature of the mobile experience is that it gives you your account and rollover points balance at the top of the screen so you can easily track it without navigating into your account. Click here to open your account at GTBets! You can read a review of the GTBets Casino here. Love this site, never heard of it before but thought I'd deposit $50 and just give it a test. Well I like the site - simple and straight-forward. I just want to bet on whatever I want to bet on and the website laid the options out in a user-friendly way. I like this site.